After the great success of the event in 2005, of course we wanted to repeat it. 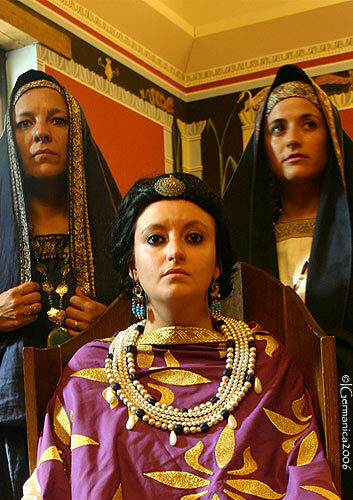 Unfortunately, this year we did not manage to gather as many Late Roman re-enactors as we had last year. With the start of the summer season, we secured the attendance of about 40 people, 25 of them Late Roman soldiers. That number varied a bit during the event, with people coming and going, but we still managed to put a troop of about 20 soldiers in the field. Fectio, together with the Minervii, the Batavi, the Teuxandrii, the Foederati, Legio I Minerva, Legio I Germanica and the Septimani, we all made sure it turned out to be a great event! 13.00-13.40 Parade through the entire park & Presentation in the Arena (all groups), followed by live missile firing outside the arena. 15.00-15.30 The Cavalry training: the infantry form up in close ranks to be a practise target for the cavalry (all groups).